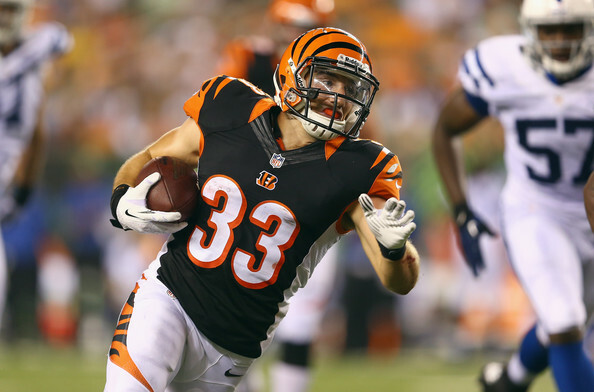 In his first two NFL seasons, Bengals running backRex Burkhead rarely got the ball, with just 16 total touches. This year, the Bengals plan to change that. Although Burkhead remains third on the running back depth chart behind Jeremy Hill and Giovani Bernard, the Bengals like Burkhead’s ability enough that they’re going to find ways to get the ball in his hands. That means playing him about half the time at running back and half the time at wide receiver. Bengals offensive coordinator Hue Jackson says it’s all about getting the best players on the field. Burkhead lined up at wide receiver in the Bengals’ playoff loss to the Colts and had his best game of the season, catching three passes for 34 yards and also picking up 23 yards on his only run of the game. Now Burkhead is learning to play receiver regularly. If Burkhead can learn to run those routes, he can play a big role in the Bengals’ offense — something he hasn’t done in his first two seasons.